I’m fascinated by the cover of yesterday’s Sunday New York Times. Fixated on the image of Boston Marathon suspected bomber Dzhokhar Tsarnaev, I was momentarily unable to notice the words surrounding it. I was a little stunned, then angry, then captivated. The image, not just the Instagrammed selfie of Dzhokhar, but this photo within the culturally significant New York Times front page, is endlessly sociologically fascinating. 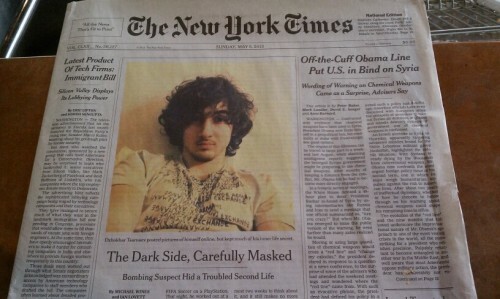 Wonder what Boston marathon victims think of the huge, swoony photo of Dzhokhar on the front of today's NYT. This cover and the anger around it should be understood alongside the noteworthy #FreeJahar movement (Dzhokhar’s friends called him Jahar). Many people have expressed very positive feelings over Dzhokhar—including through the #freejahar tag on Twitter as well as fan-Tumblrs and so on—and what is brought up quite often is his disarming good looks. It might appear that the New York Times is playing to the #FreeJahar crowd here with such an enchanting shot. Further, within photojournalism, it is quite controversial to use photos that go out of their way to obscure reality with dramatic editing such as a faux-vintage filter, something I discussed when the paper ran award-winning faux-vintage war photos from Afghanistan. While the New York Times had previously used more “objective” photos of Dzhokhar, for yesterday’s cover, the paper opted for a glamour shot. Why? What the New York Times was very likely trying to do is play on the juxtaposition between Dzhokhar-the-bomber and Dzhokhar-the-kid, the inherent tension of a swoon-worthy-murderer will sell lots of papers. In all of this, one must wonder, like the tweet above, if those affected by the Boston Marathon bombing find this treatment disrespectful? Beyond just right or wrong, the fact that the paper chose an Instagrammed selfie is novel and interesting in and of itself. The image does capture well the story it accompanies. The article is, in my opinion, a well-told and intriguing story about Dzhokhar’s efforts to cover a disturbing set of motivations with a likeable exterior. The faux-vintage Instagram glow on an attractive selfie might very-well be a paradigmatic modern example of the sort of identity “face work” we all engage in. The selfie is, of course, face work in the literal sense that it is a photo of one’s face, but also in the way Erving Goffman famously discusses “face work”: as the demonstration and maintenance of positive social value and attributes in an effort for acceptance and approval. 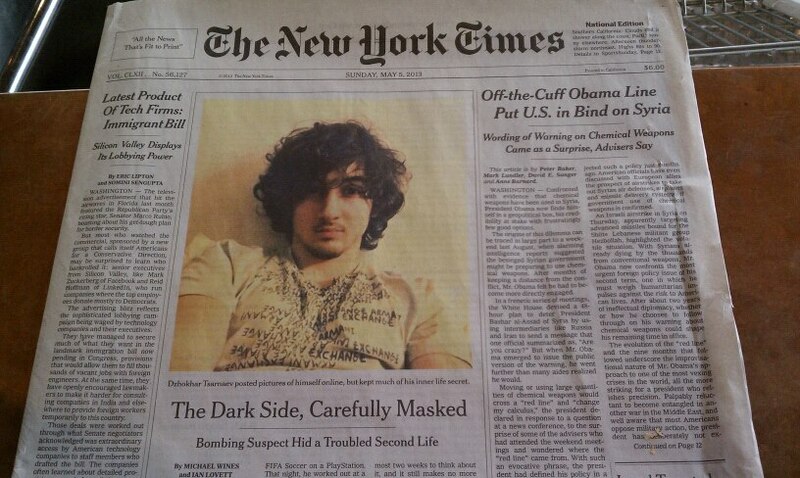 Goffman notes that this is a “’working’ acceptance, not a ‘real’ one”, which is precisely what the New York Times story describes Dzhokhar attempting to pull off in this front-page selfie. Granting, of course, that Dzhokhar’s face work was certainly of a radically larger scale, selfie face work is a sort of fiction that is a common fact. The filtered selfie isn’t the most objectively accurate photo, but it might have been the most honest. It’s how he presented himself, down to the name-brand shirt, and it’s how many people his age understand and perform for increasingly ubiquitous photographic documentation. It’s a sort-of unreality that’s carries a sort-of truth. The selfie isn’t just any photo of you, it is, of course, one taken of yourself, by yourself, and there is something simultaneously fitting and upsetting in the young bomber taking his own mugshot. The Page One bomber selfie also challenges what many of us thought the bomber would look like on the day the tragedy occurred. This image doesn’t conform to what “we”, as a culture, wanted, perhaps even needed, the bomber to look like. Instead of the stereotypical guy-in-a-cave or guy-in-a-shack, Dzhokhar here looks like someone we might know. More than that, given that this is an Instagrammed selfie, he even acts like someone we know, someone we recognize as “normal”. It breaks from the script: The bomber was never supposed to be so familiar. The bomber selfie forces us to confront that violence doesn’t always come from an other. It is even cropped square; I can almost picture the now-customary “like” or “<3” Facebook and Instagram buttons with this photo. As such, this front page acts a bit like a mirror: the Instagram filter forces us not to just see Dzhokhar, but ourselves, our own, modern, culture, too. What other angles here have I not yet considered? Or perhaps it is still too soon to engage in this sort of meta-conversation around this tragedy, apologies if so, but this cover struck me as culturally significant for the reasons I’ve tried to articulate this morning, saying something important about what it means to be alive in 2013, . You are dead on with the faceworking. I would argue that the millennial generation is very cognizant of their faceworking, although they do not call it that, and that Dzhokhar's presentation of self is almost as false or non-genuine as most of the facework you see on facebook and instagram. We select small moments, tiny fragments even, from our lives to represent the totality of our being thus it is never accurate and false so to speak. There's also something Romantic going on in some selfies - the self reflecting on the self in solitude. That code seems definitely to be at work here (the brooding gaze, the eyes hiding behind the hair). And then that fits with Romantic mythologies of the alienated outsider which can have a part to play in acts of violence. So the ordinariness of taking the selfie is possibly counterbalanced by that quest for specialness which see here. The self performing a drama of both shunning others (hiding behind the fringe, expressing rejection of social interaction through the sulky face) and needing them (putting the picture on social media, or demanding an audience on a huge and horrific scale). Does this feed the narcissism of those who already feel empowered to take other people's lives? The size of the picture might deserve more attention; when was the last time you saw a posed photo of a single person, of that size, on the first page of the NYT? "there is something simultaneously fitting and upsetting in the young bomber taking his own mugshot"
this is what most struck me about it! so often the photos splayed across papers are mugshots—photos that show a person captured, dominated and neutralized, deprived of agency; photos that are cold and hard; photos that are almost deliberately unflattering. yet in this, the image that arguably will come to represent (even define) Dzhokhar Tsarnaev comes to us through his own vision, not through the gaze of the state. i'm not certain i can think of another case where this has happened. that through this image and its page 1 NYT placement, Tsarnaev retains some semblance of agency—a way to speak freely for himself, even though he's no longer free and can no longer speak; a way to remain who he was rather than who he became, and who the prosecution (and much of the world) will say he is—is just so endlessly fascinating to me. last thought, along the lines of Goffman's "face work": Holy Reveal And Conceal, Batman. A great deal many people know that Dzhokhar was a recent immigrant, and that his citizenship was only a short, chronological distance removed from the bombing incident. His photo reminds viewers that he embodies all the hallmarks of similarity to our societal norms, but the alleged bombing act combined with immigrant background are instantly summoned at the same time one views the 'selfie'- and the sense of the other is replicated anew. Dzhokhar might have had agency in creating the photo, but its use in the NYT would lend itself more to distancing, to creating the other, by exposing the naked 'similarity' his photo-act reveals. In becoming too close, his selfie creates a 'similarity gap' that quickly becomes a chasm for which the 'other' can be clearly defined. If you combine this with the recent stories coming out on how terrorist organizations are using modern technology to educate and train small groups, then the second quote I provided above becomes more clear. Many would see the Boston Bombings as an 'outbreak' of terrorism, and having a recently naturalized citizen become the alleged suspect in such a bombing reinforces for many the idea that the war on terror still has battles to be fought. Dzhokhar becomes another symbol for the failed process of assimilation through his use of an 'Instagrammed' selfie, and the sense of 'outbreak' only reinforces for the viewer the idea that he never wanted to become an American, thus could never be one of 'us'- only the 'other' many have come to fear. So I'm not sure the use of the photo makes modern culture see itself, or that violence, in this case, came from a distinct 'non-other'. Perhaps it lends more to the idea that Dzhokhar could never be modern in the first place, he could only be the 'other'. I wonder about the banal fact of his whiteness. How presenting him as attractive actually helps to save whiteness. His attractiveness allows for a different kind of reading, a reach for psychological depth (in Discipline and Punish Foucault describes the ultimate form of discipline as a never-ending quest for knowledge, the endless production of data, psychological, biological, and so on). Contrast this with the faces of most black criminals, which often emphasize ugliness: unkempt, odd, undesirable, often in prison garb. I'm intrigued by what surface is being saved and for what reason: the surface, something called whiteness, must be saved. A lot of labor happening in this photograph. Dzhokhar Tsarnaev created this image (can we really call it a photograph at all, photography being pretty much extinct) as a virtual artifact which the Times transformed into an analog artifact, (analog being the proper opposite of virtual/digital which all are after all, matter and energy and information differing only in the informational dimension) at least insofar as a copy of the paper, and therefore the front page, sits on my couch like an archeological artifact which is to say, to borrow a Haraway phrase, a copy without an original, patina and all, because it is a simulacrum, that is to say, something intentionally distorted to appear correct to the viewer, which is to say an other without a subject, even if the viewer was, or included DT himself. What I find additionally disturbing about this front page selfie is the article title and subhead that go along with it. "The Dark Side, Carefully Masked" and "Bombing Suspect Hid a Troubled Second Life". So what are we to read as the "dark side", "the mask" and the "second life" here? It's deeply ambiguous and all reads are problematic for one reason or another. Heck, there's even got a digital dualist read tucked in there (e.g., Instagram-style selfie as indicator of another, darker and troubled self...the self that lives on the internet and gets into trouble there). Nathan, I was just curious to see whether you've thought more about the issues raised in this post, especially in the wake of today's discussions of the Tsarnaev Rolling Stone cover.